The world’s biggest phone maker, Samsung has added a new smartphone to their Galaxy A series with 4 awesome cameras. Galaxy A9(2018) is the world’s first smartphone with four cameras and priced at Rs. 36,900 and Rs. 39,990 for both 6GB and 8GB RAM respectively in Indian market. This is a big upgrade from the conventional one camera on the rear to whopping four cameras. Let’s briefly look at the key features of this new smartphone. Camera is undeniably the major selling point of the new Galaxy A9(2018) smartphone, and has been termed ‘the world’s first quad camera smartphone. The phone packs a whopping 24 MP primary camera, an 8 MP ultra-wide sensor, a 10 MP telephoto lens and a 5 MP depth sensor, all well arranged in the back. The front hosts single 24 MP camera that contains 2x optical zoom. The Galaxy A9(2018) shooters have depth lens that enables users to manage the depth and field of the pictures with ‘live focus’ feature that makes sure all photos come out perfect. In addition to all these, intelligent camera concept is also available in the new Galaxy A9 smartphone. This concept can helps in optimizing the cameras to the highest quality and recognizes up to 19 kinds of scene and choosing best color to suit the content. This is just a great upgrade. Also, the front camera supports AR Animoji and wide-selfie camera. 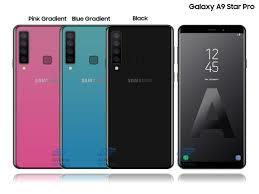 Galaxy A9 (2018) has a 6.3 Super-Amoled display and size, which makes it a phablet and is not pocket-friendly at all. You can even feel uncomfortable holding in one hand for a very long time. The fingerprint scanner is at the back, and the power button stationed at the right-hand-side of the phone, alongside the volume button . The left-hand-side of the phone contains the Bixby button. The USB-C charging port , headphone jack and a mono speaker are well arranged on the bottom of the phone. The SIM slot and MicroSD card slot seats on the top . Galaxy A9 comes in two variants- a 6GB RAM variant and 8GB RAM variant, with both models having 128GB storage, that can be expanded with microSD card(up to 512GB). The phone is powered by Snapdragon 660, with Chipset. Galaxy A9 runs smoothly on Android 8.0 Oreo without any form of lagging (thanks to the powerful RAM). With this phone, you can run multiple Apps without lagging or loss of data. The fingerprint scanner is very responsive and fast in scanning user’s finger. But the facial recognition feature is a bit slow and needs serious upgrade. It most often doesn’t recognize user’s face in one trial. The phone comes with 50 pre-installed apps. Galaxy A9 comes with 3,800mah battery which is too low for such high tech smartphone. Why did I say this? 3,800mah battery, during moderate usage, with some heavy apps and games on, can go beyond one day. Though, the battery supports Type-C fast charging technology, but more power should have been giving to the smartphone.